According to “Statistics Canada” Seniors or those aged over 65 years account to over 16.9 per cent of the overall Canada’s population, while those between 55 and 64 years old outnumber those aged 15-24. This accelerated pace of the greying population comes with profound emotional needs, especially when it comes to matters of love and companionship. On this regard, there has been an increased interest in the senior dating niche from several online dating service providers operating in Canada. In this article, We highlight the top 5 best senior dating sites in Canada 2018. 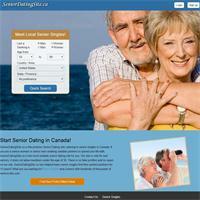 SeniorDatingSite.ca is the premier dating site that caters to senior singles within Canada. As such, they do not allow members under the age of 30. For over 17 years, SeniorDatingSite.ca has helped many senior singles find their soul mates and life companions. Unlike other platforms, SeniorDatingSite has a straightforward sign-up process. You just need to create a profile, upload/import photos and provide a brief description of you and your potential match. SeniorDatingSite seeks to provide their senior members with relevant dating tips and advice that will help them have an enjoyable moment on their first date. SeniorDatingSite takes security and online safety very seriously; as such, they provide their members with safety tips that enable them to have a more fulfilling experience while using the platform. There is no way to determine authenticity of members’ profiles as there aren’t sufficient checks during sign up. EliteSingles is a world-renowned online dating service provider with many years of experience in a number of dating niches including senior dating. With the aid of EliteSingles, seniors are able to dictate what they want from a relationship/partner. EliteSingles match their over 50 singles based on their personalities, and specific location matches across Canada. One of the hallmarks of EliteSingles is their personality tests that seek to identify different personality types by asking as many questions as possible of their prospective members. EliteSingles strive to connect compatible seniors based on compatibility and personality ensuring that the connections established on the platform are built to last. They achieve this by matching all their senior members with between three to seven tailored partner suggestions on a daily basis. Long distance relationship is not for everyone especially for the seniors. With EliteSingles, you can filter your search to your particular city within Canada such as Toronto, Ottawa, Vancouver, Montreal, Calgary or Edmonton. This means that you can find love and companionship within your city/town. 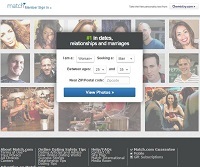 SeniorMatch is a Silicon Valley firm that has been on the online dating scene for over 17 years. It focuses on over 50 dating and restricts prospective members under the age of 30 from setting up a profile on the platform. This has ensured that over the years SeniorMatch has been able to maintain and restrict membership specifically to mature singles. SeniorMatch provides a platform where eligible members can find love and companionship no matter their past/present situation. It has a dedicated Canadian Senior dating platform within their website https://www.seniormatch.com/senior-dating-in-canada.htm. This is a unique feature that is not found in many senior dating platforms, with this feature senior members share their ideal first date ideas/activities, favorite food and drink, arts and culture etc. This feature provides a platform for members to share their life experiences and interests with other members in their own words. This feature is the first starting point for members who wish to be acquainted with other members. Chatting is not a preserve of the millennial, at least according to SeniorMatch. This feature provides members with different communication channels for the members of the platform. This is yet another amazing feature that enables members to organize and participate in common interesting activities such as traveling, indoor and outdoor activities and adventures. Related to (#1) above, some profiles on the portal are fake or suspicious. 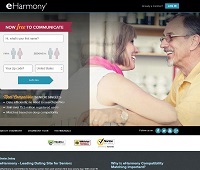 eHarmony is not only a dating platform BUT also a relationship site. Through this platform, mature and senior Canadian singles can find and establish meaningful relationships. Unlike other senior dating platforms, eHarmony uses advanced technology that focuses on compatibility as a key factor to establish long-lasting relationship commonly referred to as the “29 Key Dimensions” of compatibility. To achieve that objective (compatibility), they’ve designed an extensive questionnaire that seeks to establish the interests and core values of new members. This unique feature was incubated and patented by eHarmony’s founder. With this feature, prospective members are required to fill up an extensive questionnaire that seeks to identify different dimensions of their personality with the aim of matching new members with other members who share their interests and core values. This feature ensures that members are matched with compatible singles within their cities. This feature provides members with a platform where they can share experiences and issue dating/relationship advice to fellow seniors. Match.com is a pioneer of online dating. In fact, it boasts of being the #1 dating, relationship and marriage website. Over the years, it has added extra offerings to its services including senior dating. Search Filters enables senior singles to narrow down their searches in line with their preference and interests. With this feature, you can tell who your secret admirers are by checking which members view your profile often. This feature provides members with the option of either signing up/logging in via Facebook. As clearly highlighted above, these are excellent senior dating platforms operating in Canada. Therefore, no matter your past or present circumstances this is the time to select a platform that best suits you and start off your journey of love and companionship.